Guatemala is a country full of lush scenery, fertile volcanic soil and intense cultural preservation. But despite its natural beauty, Guatemala is also a place where chronic malnutrition plagues much of the population, especially children under five. Chronic malnutrition occurs when a person does not receive adequate nutrients in their diet over time, and can lead to stunted growth and other health complications. 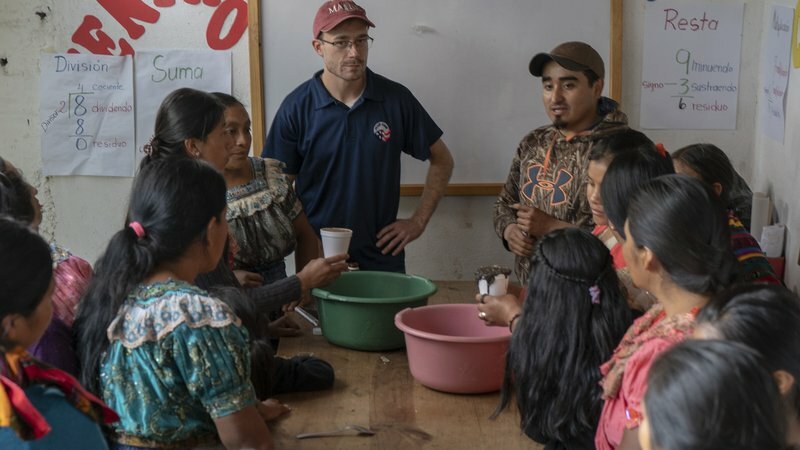 The Peace Corps has partnered with Guatemala's Ministry of Agriculture and USAID under the U.S. government's Feed the Future initiative to tackle issues of hunger and malnutrition head on. 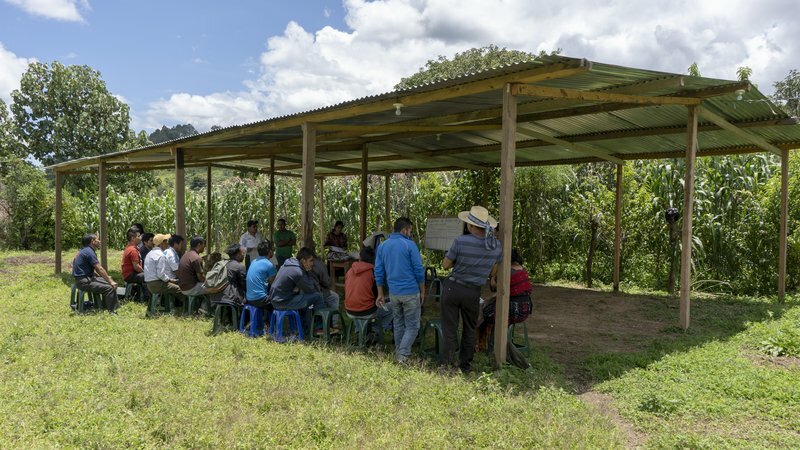 Volunteers in the rural extension project in Guatemala work directly with municipal level extension agents who are technical experts in agriculture and nutrition to effectively transfer climate-smart agricultural practices and improve food security among the families they support. Liat Perlin and her counterpart stand among the corn in a local family's garden plot. Volunteers work with their partners to ensure extension activities are inclusive, participatory and asset-based. They promote hands-on learning in place of lectures, showing instead of telling, and customizing lessons and other extension activities to the audience. Liliana Cruz and her counterparts lead an asset assessment activity with a community group in Guatemala. 1. They practice asset-based community development. Volunteers spend several months getting to know their communities and gaining confianza (trust) to help them better understand the needs of the community. Together, Volunteers and extension agents work with communities to identify assets that are already available. In this way, the conversation doesn't begin with, "What do you need?" but instead with, "What do you already have, and how can we use that to get you closer to where you want to be?" 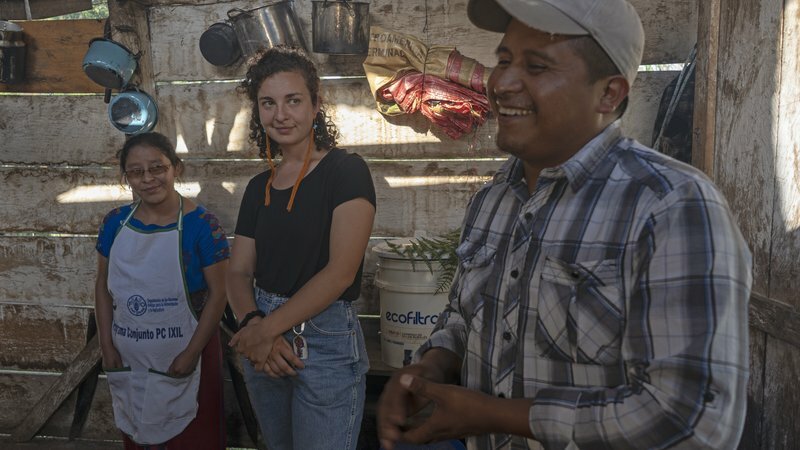 Daniel Bracamontes and his counterparts started a greenhouse seed bank in a neighboring village to help families start their gardens and reduce their reliance on purchased seeds. 2. They promote nutrition-sensitive agriculture. Global food insecurity presents a broad challenge. While one person may not be able to end hunger worldwide, the Peace Corps' philosophy of grassroots development zooms in on the collective impact made by individuals. That's why our Volunteers and their partners in Guatemala are working one-on-one with villages and the families who live in them to plan and cultivate family gardens. Small family gardens don't require large plots of land and can help substantially to supplement the family's diet with nutrient-rich, fresh produce. Devon Colegrove, or Diego as he's known in his community, and his counterpart check tomato plants in the greenhouse where they teach youth about crop cultivation for income generation. 3. They believe in empowering young people. Guatemala's population trends young. 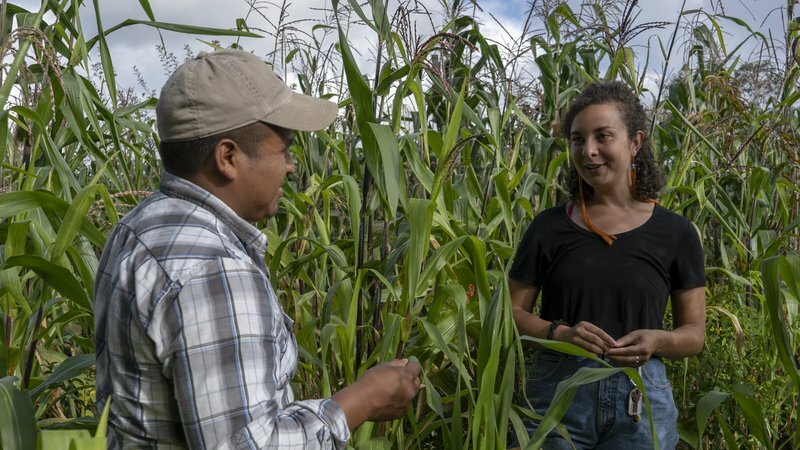 More than half of the population is under the age of 19, so it's no surprise that extension agents and Peace Corps Volunteers aim to bring youth into the fold when working on projects in food security. 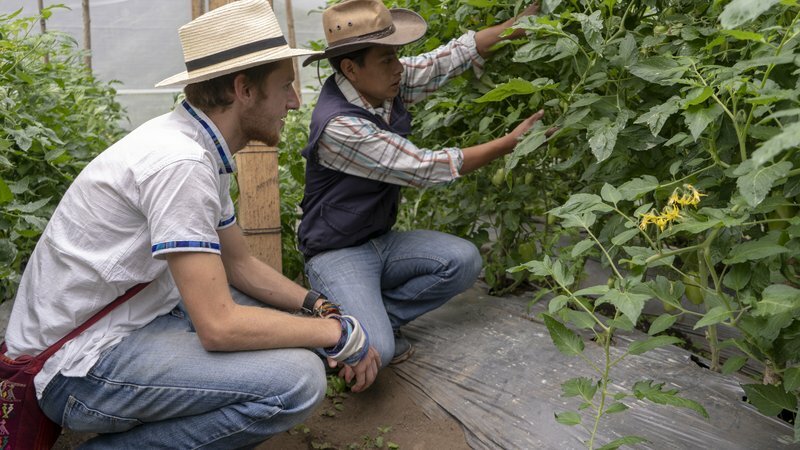 Devon Colegrove and his counterpart work with a youth group in one of the villages they support to grow tomatoes and bell peppers in greenhouses as a source of income generation. Once ready for harvest, they sell the produce in the market and to local primary schools, thus supplying the wider community with fresh vegetables. Will Penner and the agriculture extension agent in his municipality lead a demonstration on soil health. In Guatemala, there are more than 20 spoken languages – only one of which is Spanish. 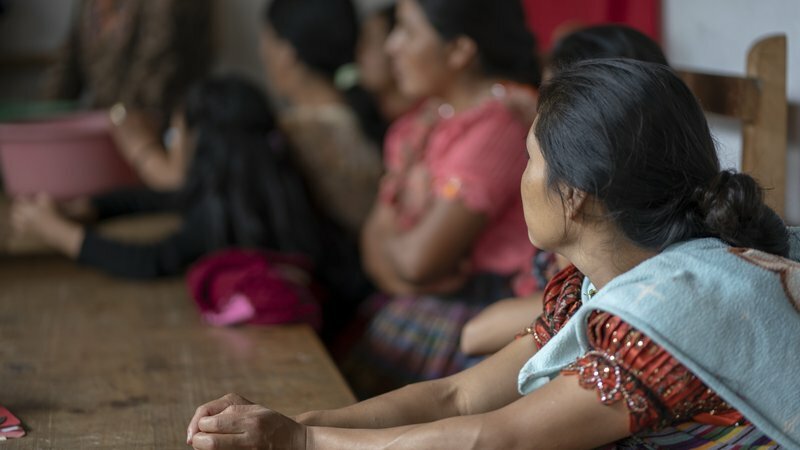 In some of the aldeas (villages) where Volunteers work, community members might only have a limited understanding of Spanish, or simply be more comfortable conversing in Ixil or K'iche', two of the many indigenous Mayan languages spoken there. No matter what language they speak, adult learners gravitate toward experiential learning. Will Penner and the extension agents he partners with know this well. To start a conversation about soil health with a local women's group, they poured hydrogen peroxide into cups filled with three different types of soil. If the soil was full of nutrients and organic matter, the peroxide would cause it to bubble up and out of the cup; if it lacked the needed nutrients, well, nothing happened. It was a simple, inexpensive way to show instead of tell, and it got the group excited to continue learning about growing healthy gardens. Liat Perlin stands with her partner agriculture extension agent and home health educator next to a wood-burning stove. 5. They innovate in the kitchen. Boxboles, pepian, comida tipica. If there's one true statement about Guatemalan cuisine, it's this: there will be corn. Guatemalans eat corn in some form or another with nearly every meal, be it tortillas, tamales or porridge. While corn is a steady staple crop in Guatemala, it lacks certain nutrients required for childhood development and a well-rounded diet. Liat Perlin and the home health educator she partners with took this into account when they taught a local women's group a recipe for tamales stuffed with frijoles (beans) and a nutrient-rich, native green. Rather than creating an entirely new recipe, they showed the women how simple it was to add the greens into a dish they already know how to make. Women engaged in a lesson about soil health. 6. They work with women. In rural Guatemala, traditional gender roles tend to dictate the types of activities men and women engage in. Large-scale farming? You'll usually find men working the land. Family gardens and dinnertime? Women typically manage those activities as part of the household duties. Volunteers and their counterparts understand that tackling chronic malnutrition requires a whole-of-community approach at all stages, from the farm to the dinner table. Working closely with women helps ensure that nutrition-sensitive crops make it into the cooking pot. Rachel Moore and assists her counterpart with harvesting oyster mushrooms. 7. They promote income-generating activities that help improve food accessibility. Improving the quality and yield of nutritious produce is important in the fight to #endhunger. But what happens when a particularly aggressive drought comes along and ruins your garden harvest? Having additional sources of income helps families to be more stable in the face of shocks and stresses, like extreme drought. Volunteers and their counterparts are working with community groups to identify income-generating activities that can help provide that added economic stability. Rachel Moore's community extension agent is teaching women's groups around the municipality how to grow mushrooms from corn cob waste. Mushrooms aren't typically seen in local markets, but when they're available, they sell quickly. Having an additional source of income helps ease the burden on families when it comes time to buy food. For more information on the Peace Corps' rural extension project in Guatemala, visit their country page on our website. As one of 11 agencies that comprise Feed the Future, the Peace Corps has been actively involved in developing the U.S. Government’s Global Food Security Strategy [PDF] under the Global Food Security Act. 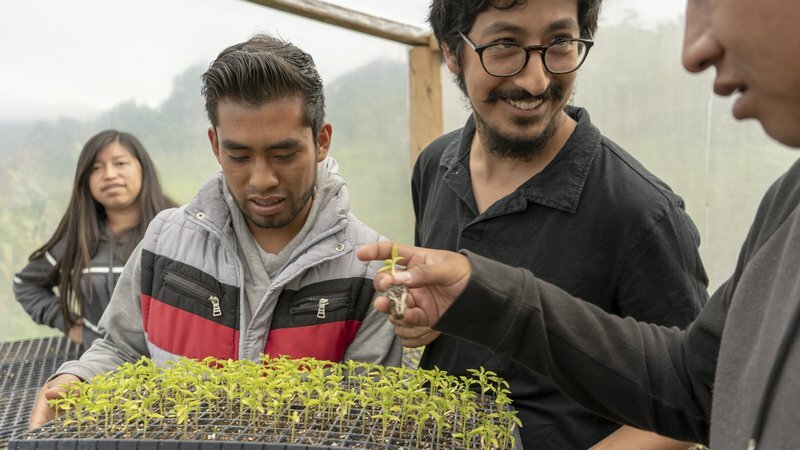 Read the Peace Corps Global Food Security Implementation Plan [PDF] to learn more about how Peace Corps Volunteers around the world are working with their communities to #endhunger.